Frontiersman Stephen Meek persuaded over 1,000 people with 200 wagons to avoid the notorious Blue Mountains, Cayuse Indians, and Columbia River by turning west up the Malheur River into central Oregon. 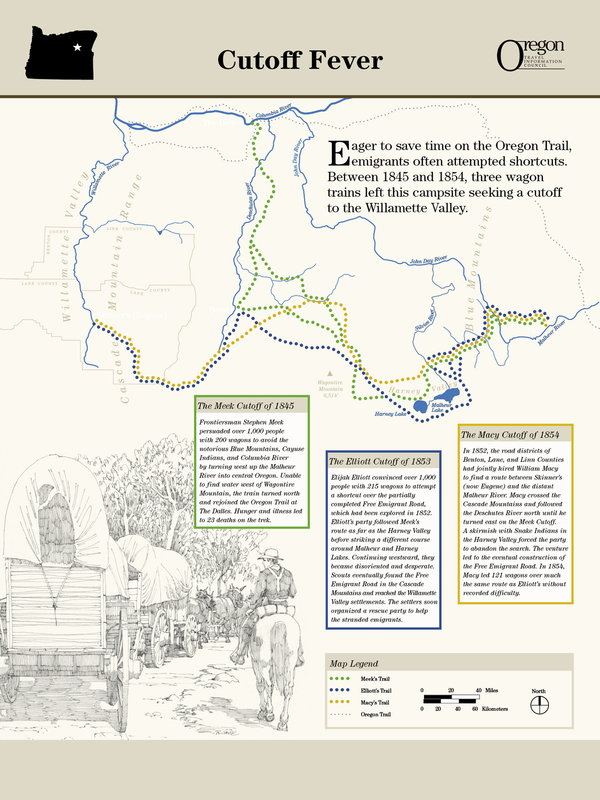 Unable to find water west of Wagontire Mountain, the train turned north and rejoined the Oregon Trail at The Dalles. Hunger and illness let to 23 deaths on the trek. Elijah Elliott convinced over 1,000 people with 215 wagons to attempt a shortcut over the partially completed Free Emigrant Road, which had been explored in 1852. Elliott’s party followed Meek’s route as far as the Harney Valley before striking a different course around Malheur and Harney Lakes. Continuing westward, they became disoriented and deperate. Scouts eventually found the Free Emigrant Road in the Cascade Mountains and reached the Willamette Valley settlements. The settlers soon organzied a rescue party to help the stranded emigrants. In 1852, the road districts Benton, Lane, and Linn Counties had jointly hired William Macy to find a route between Skinner’s (now Eugene) and the distant Malheur River. Macy crossed the Cascade Mountains and followed the Deschutes River north until he turned east on the Meek Cutoff. A skirmish with Snake Indians in the Harney Valley forced the party to abandon the search. The enture led to the eventual construction of the Free Emigrant Road. 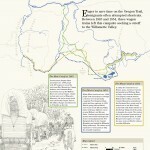 In 1854, Macy led 121 wagons over much the same route as Elliott’s without recorded difficulty.